Preheat the oven to 350˚. In a small bowl, mix the pecans, sugar, and five-spice powder with the butter until you have a fine, crumbly mixture. Rub generously over the ham, patting the crust with your hands. Scatter the onions in the bottom of a heavy roasting pan and add about 2 cups water. Place the ham on the bed of onions. Slide the pan into the oven and roast for about 2 hours, checking to make sure there’s still liquid in the pan. As the water evaporates, add a bit more. The ham is done when a nice glaze forms on the outside. The pecan mixture and the water in the pan will create their own sauce to pour over the ham after you’ve sliced it into beautiful pink rounds. If the sauce seems too thin, just pour into a saucepan and reduce it. 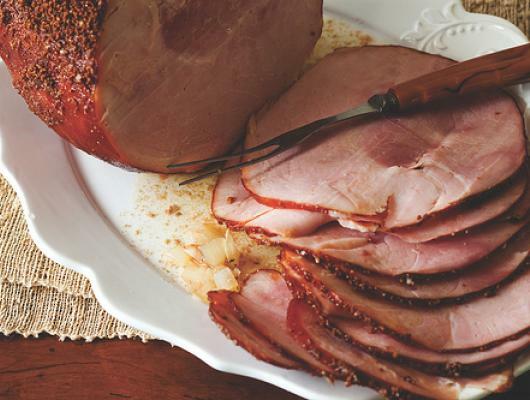 Chances are you won’t find a really good cooked or smoked ham in the supermarket. It’s hard to determine quality by looks alone. All I can say is never use canned ham, and search out a good Italian butcher or ask at your farmers’ market for the best local cooked ham. In the South, we pretty much have pecans coming out of our ears. As a matter of fact, there’s nothing our pigs like more than pecans. 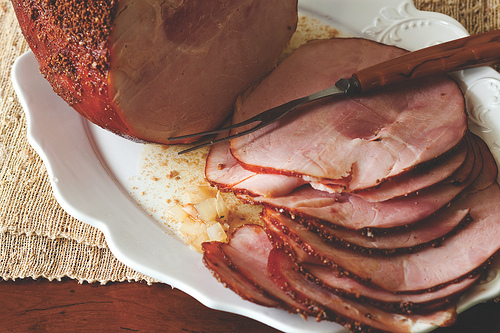 We like to coat our hams with pralines, those sweet candies made in New Orleans. But brown sugar and butter will work almost as well if you’re careful to use soft butter and make sure to mix all the ingredients well before you slather the mixture on the ham. This recipe is from My Family Table: A Passionate Plea for Home Cooking by Chef John Besh. Authorization to print courtesy of Andrews McMeel Publishing.